My apologies, dear WordPress folk, for the delay in posting this conclusion, and also for my scarcity as a blog follower. I’ve been adjusting to a new medication these past two weeks, and it’s worked some strangeness with my motivation and energy. Indeed, for a time, I wondered if it hadn’t robbed me of the ability to write at all. This portion of the story was written on meds. I’ll let you judge whether it still sounds like me. Reggie found a quiet corner of the woods, where he sat and cried. After Oscar and Sal had told him about the people of the lighted city – how they were mean and how they attacked and injured innocent creatures like Stanley the Crow – Reggie felt his dreams were falling apart. He was full of despair – a sadness of the most awful sort – that flows more bitter than tears and settles deeper than butterflies in the stomach. It was the sort of sadness that does not easily go away. While immersed in this deep sadness, Reggie was suddenly startled by a rustling from a group of nearby bushes. Something was there, and just as Reggie was about to flap away, a dome shaped head, coated in black feathers, poked out from the bush. “What are you crying about, little bat?” came a strange voice from the dome shaped head. The voice sounded like it was bursting through a pipe full of gravel. Reggie recognized the head and the voice to be Stanley, the one-eyed crow himself. “Oh! You scared me, Mr. Stanley!” Reggie yelped. “Sorry, little bat.” cawed Stanley. “I have that effect sometimes. One eye and all.” He flashed a smile toward Reggie, but since his mouth was a beak, it didn’t look much like a smile. “I was just digging in this bush for some berries when I heard you crying. What’s wrong? Would you like to talk it over with an old crow like me?” Stanley extracted himself from the berry bush, fluttering his black, feathery wings as he did so. Those feathers covered him from dome to legs, and the shiny darkness of them reflected the small amount of light that still shone among the trees. He was a fine looking crow, but for a silvery scar where his right eye ought to have been. It seemed to Reggie that Stanley was a decent enough creature; indeed, unlike most other forest creatures, he didn’t seem interested in teasing him. “Mr. Stanley, sir? Is it true that you…” Reggie became quiet, too embarrassed to ask the crow about his injury. “You want to ask me about how I lost my eye, don’t you, little bat?” Stanley cawed. “Well, yes. If it’s OK with you, that is.” said Reggie, sheepishly. “Oh, I don’t mind! The fact is, I wish more creatures would ask. The rumors are so much worse than the truth, as is often the case with rumors.” Reggie didn’t know what a “rumor” was, but he was quite glad he hadn’t offended the crow. “Stanley, is it true you lost your eye when you visited the lighted city?” asked Reggie. “It’s not that! I’ve dreamed of flying beyond the tall tree, to visit the city, and now I know my dream will never come true!” cried Reggie. “But the people! Those mean people – they’ll turn me into bat stew!” Reggie exclaimed. “But Mr. Stanley, your eye! The city people attacked you, and you lost an eye!” said Reggie, confused. “So you didn’t lose your eye in the city?” The bat’s voice squeaked with hope. “Why yes! It happened on a night that was very dark, when the moon and the stars were covered by the clouds. I’d stayed in the city later than I should have, and by the time I started flying back toward the woods, it was so dark, I couldn’t see my own beak!” Stanley chuckled. “So you crashed?” asked Reggie. The crow’s words sung like music in Reggie’s sensitive bat ears and caused the fur on his head to prick up. Another breeze snaked its way through the woods – a breeze ripe with the scent of adventure, the scent of the unknown, and Reggie’s heart, tiny and bold, started to flutter. With his inborn radar piercing the cloak of night, Reggie sensed the unyielding presence of the tallest tree just yards before him. Like an ancient monolith, it stood proud and solemn. He set his course on the space beyond the tree and beyond the clearing and the scurrying cars, where he would spread his wings wide across the city sky. By the change in the updrafts, Reggie knew that the massive tree was below him; he let loose an empassioned skree! ; it echoed, bounced across limbs of evergreen and down among the rocky crags and thickets and all the way down into nighttime burrows, stirring the attention of still more forest dwellers. Terrific. It held up even without reading part 1. I liked it a lot. Your story continued where you left off no change in your voice. Can’t wait for Reggie’s adventures in the city. You still have it Legionwriter!! Two things I love. The point about idle gossip. And the line that says… ” They need a reason to look up at the sky again.” Boy, do we ever. And I’m really happy every time I look up at my night sky here at home to see a bad glide overhead. 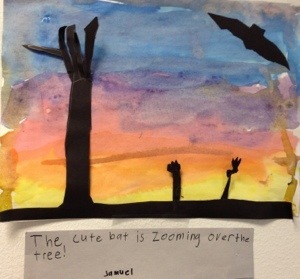 Maybe one of those bats is our sweet little Reggie. I love that you and your son are co-writing. Way to pass the baton (of course you are to young to give him the baton) But the beginnings of heritage are so endearing and powerful. GOOD DAD ! Thanks Suzie. You rock yourself.